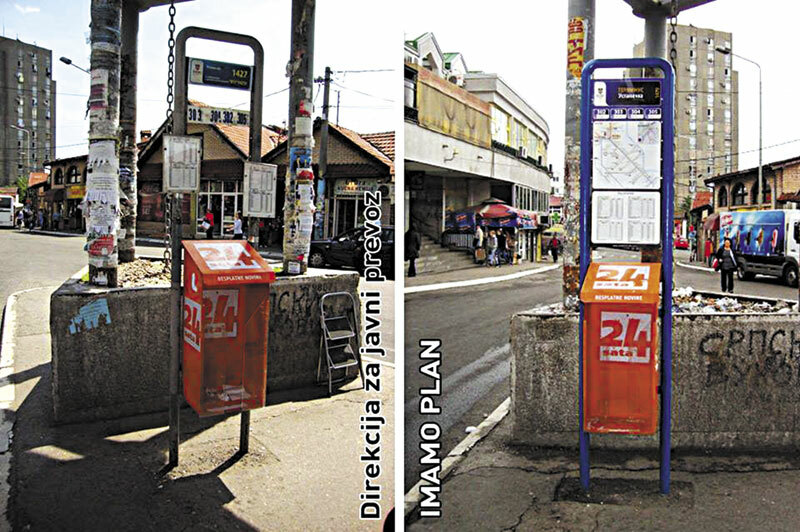 Just to show how really short-sighted it is possible to be, civic activist Filip Vukša was fined nearly €500 for repairing a dilapidated bus stop in Belgrade. The official reason for the fine was marked up as “unauthorized use of the coat of arms of the City of Belgrade” which this Dangerous Vigilante Repairman was obliged to clean up and repaint on the bus stop stand. The old worn out coat of arms, apparently, was more appropriate. Obviously, Mr. Vukša did not realize that allowing the city to fall into disrepair is part of a complex and intrepid scheme, and his acts of wildcat cleaning foiled these deeply laid plans. Moreover, the Belgrade bus authority GSP has quite purposely made their signs illegible and constructed of substandard material. How could poor Filip know? In the past, he has cleaned up public gardens and changed the bulbs in the streetlights. And so far he has gotten away with this malevolent public-mindedness. Filip Vukša belongs to a group called ‘We Have a Plan’. For writing their logo on the back of the bus stop, the group got a fine as well. Given that no one else seems to have a plan, does it seem remotely normal for the city slap a misdemeanor felony for committing the OPPOSITE of vandalism? The singular irony (which is another name for ‘the experience of living in Belgrade’) here is that Filip’s counterparts on the other side, the REAL vandals, paint graffiti everywhere and break anything that is standing up in public and, generally, walk away scot-free. Try to make things better at your peril, warns the Mayor’s office. This entry was posted in Essays, Randomizer and tagged Chris Farmer. Belgrade, coat of arms, Filip Vukša, Serbia, vigilante. Bookmark the permalink. ← Breaking News: New Book on the Loose! Brilliant post! I just read about this and was talking about it with a friend as I complained about the same sort of crazy city management in our town. Absolute insanity! !